Happy April everyone. I don’t know about you, but this month has been kinda crazy so far. I won’t bore you with all the details, but I will say that I hope you are feeling good and excited about moving into spring and summer. Seasons filled with rebirth, warmth, sunshine, color and hopefully, happiness. 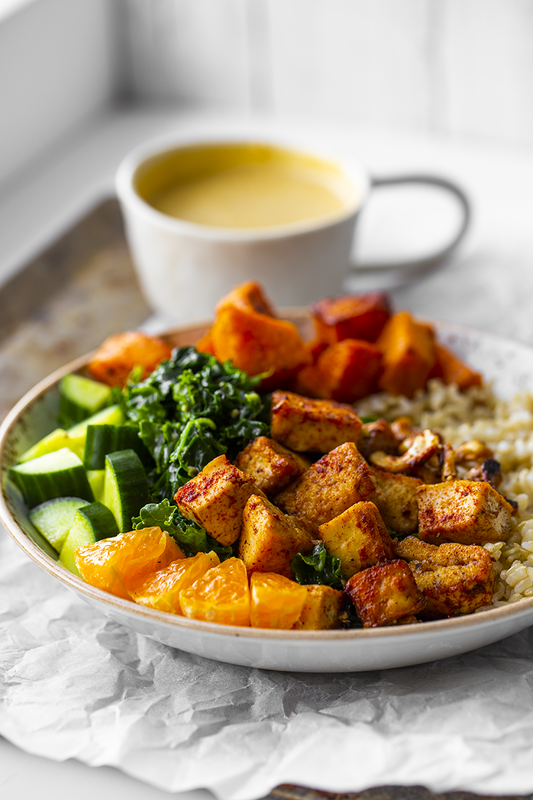 “A Buddha Bowl is a vegetarian meal served in a single bowl or high-rimmed plate, which consists of little dishes, served cold.” – Alexa, aka Amazon. 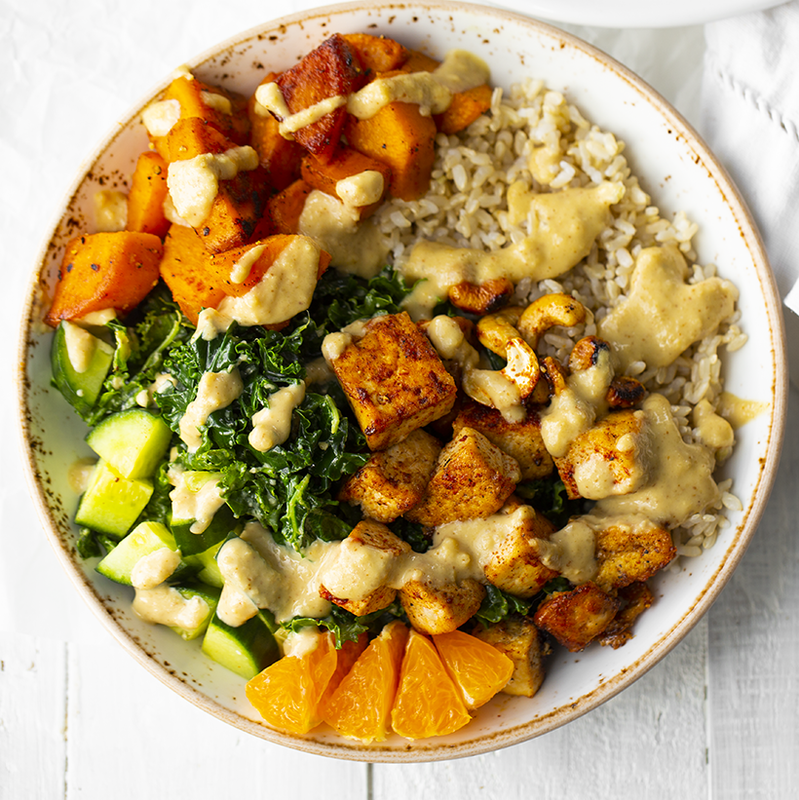 For me, a Buddha Bowl is a collection of colorful, whole-food, plant-based ingredients piled into a bowl and served with a flavorful creamy dressing. The dressings I usually see are nut or seed based. Cashew or tahini, etc. 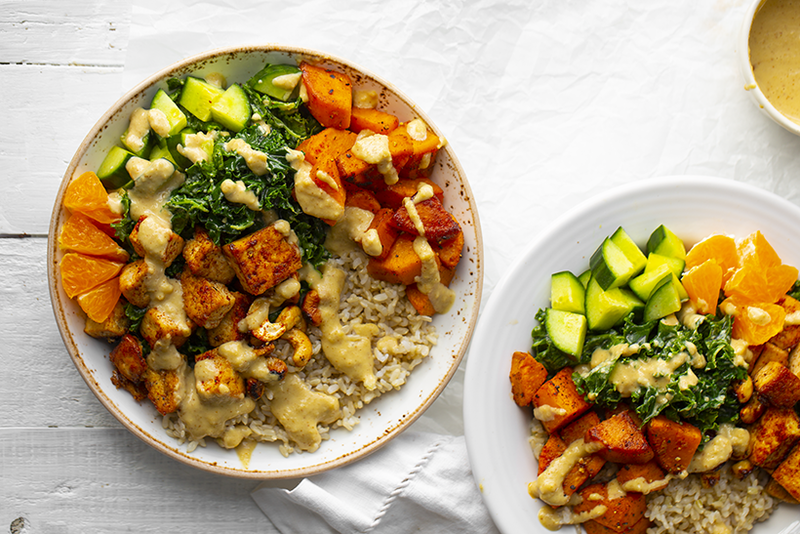 Buddha Bowls are perfect for whipping up with a misfit collection of leftover veggies – like roasted potatoes, greens and such. As well as leftover grains like rice or quinoa. I like to add some sort of protein aspect like legumes or something like tofu, tempeh or seitan. 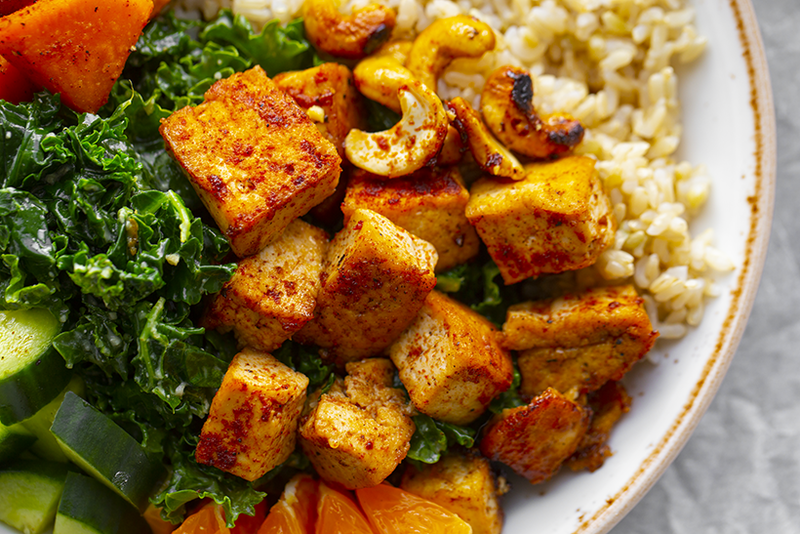 Skillet tofu with maple-spice flavors. And how could I do this, but I forgot to add the avocado! It was there, sitting on my counter all perfectly ripe and lovely, waiting to be cut and diced, but nope, I failed. Forgot the avocado. Ah-well. 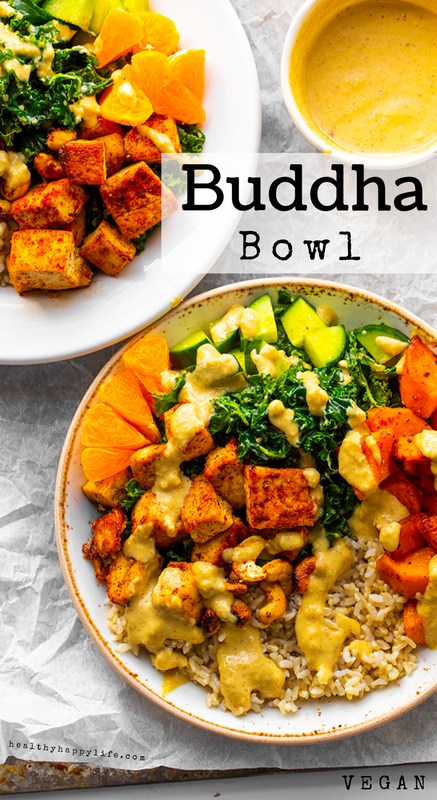 This bowl was delicious without it, but if you have avocado on hand, it is always a lovely add to a Buddha Bowl. This creamy cashew dressing on top.. Quickie Version! You could totally use a store-bought dressing in place of the homemade one if needed. The homemade dressing definitely adds a special flavor and texture, but for ease, store-bought is fine! 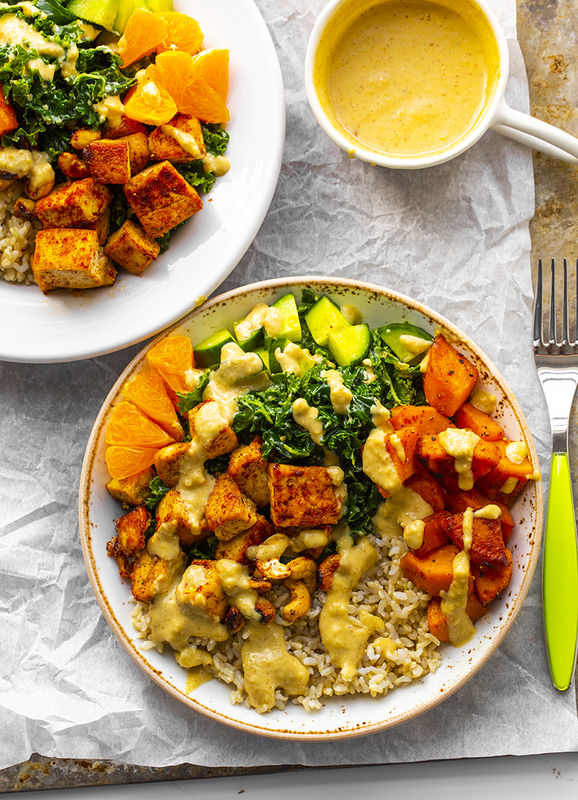 You could try a vegan ranch, vegan Caesar, peanut sauce or really any dressing you’d like. Sweet Potatoes: You could roast your sweet potatoes in the over, but to speed things up I will peel the potato, dice and then bowl until tender. Then I finish them in an oiled skillet for maximum flavor. Kale: You could just rinse and chop or shred your kale leaves – or you can wilt it like I do. Once my fluffy kale leaves are rinsed and dried, I add them to the hot oiled skillet for a few seconds. I press down and toss while they are in the skillet so that the leaves darken a bit and very lightly wilt. I find that the flavor is more appealing and the leaves more tender when you do this. Cashew Dressing: I soaked my cashews for a few hours, but this is totally optional. Just note that if you do not soak your cashews, your dressing may be slightly clumpy. Especially if you are not using a high speed blender, which I highly recommend. If you have been following my blog for a while you may already know that one of my very favorite flavor pairings is smoky paprika and maple syrup. I love this flavor duo on basically every ingredient in this bowl. Especially for the potatoes and tofu. Substitutions. You could very easily swap out any ingredient in this bowl for something similar. So like for the kale, you could use spinach or chard. For the tofu, you could use tempeh or beans. For the cucumber, you could use any other veggie you have on hand. Pepper, mushrooms, sliced onion, corn, broccoli or basically anything would work. 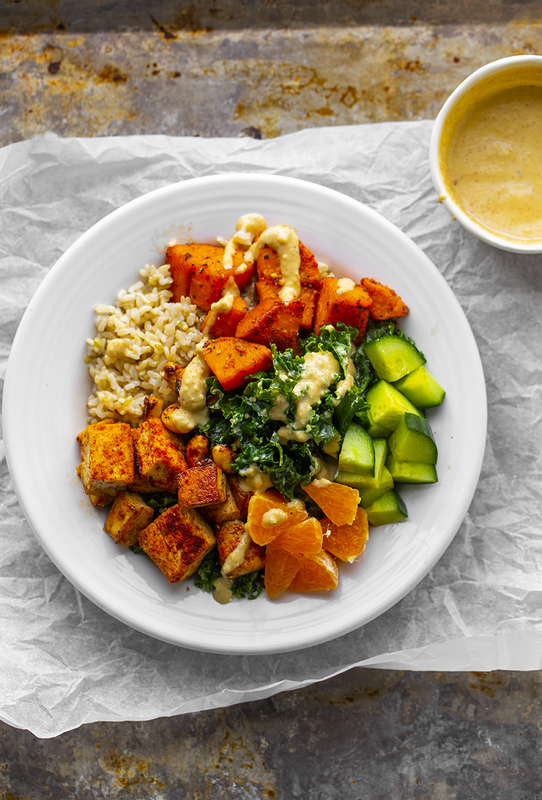 I think that is the beauty of a Buddha Bowl, you are free to customize as desired, based on your tastes and what ingredients you have on hand. 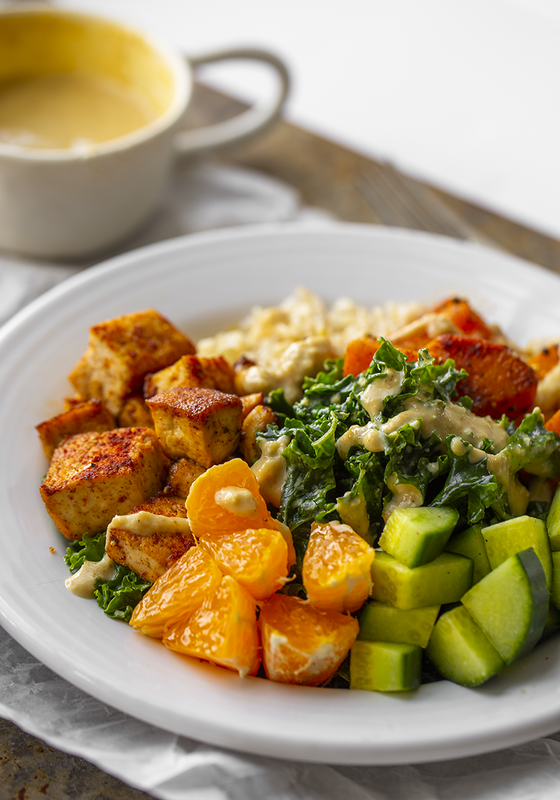 The dressing is creamy and lemony with sweet and savory, complex flavors. A hint of sweet and citrus from Sumo Mandarins. 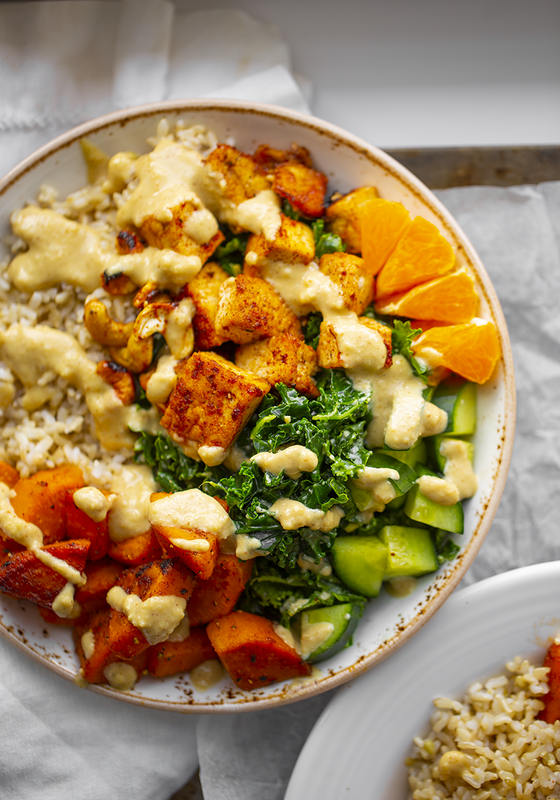 These flavorful, plant-filled Buddha Bowls are easy to make for a healthy meal. 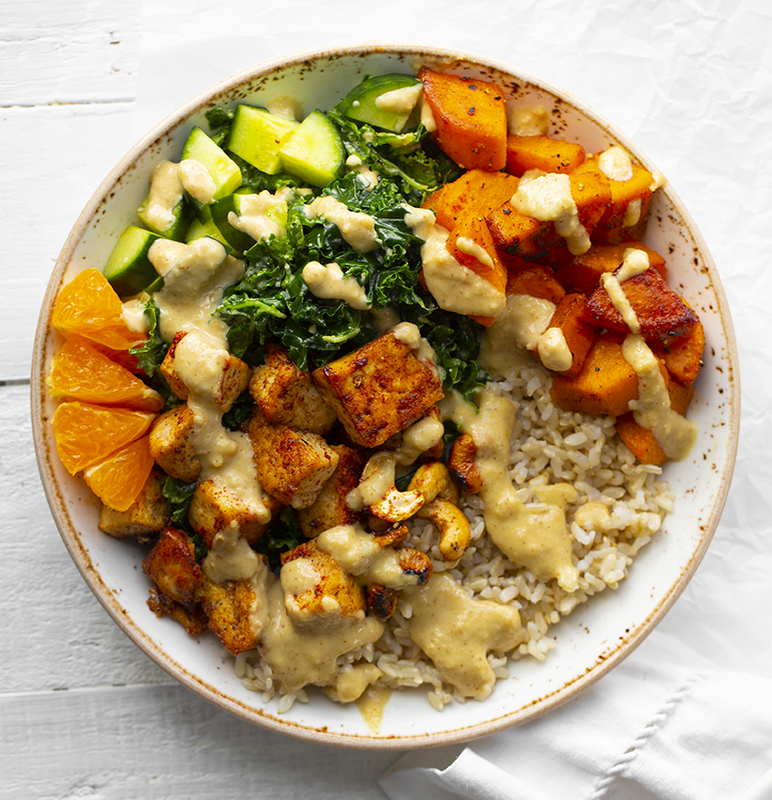 Smoky-maple flavors throughout and a creamy cashew dressing. Vegan. First, soak your cashews for a few hours. This step is optional, but may help your dressing blend to be more creamy. TIP: For easier blending, you may also want to simply double the dressing recipe and have some leftover for later. Boil the diced sweet potato until tender. Do not overcook. you do not want them mushy, just barely tender enough to pierce with a fork. They would be ready to eat, but not overly done. Strain and set aside. Prep your kale by pulling the leaves from the stems, discarding the stems and rinsing the leaves well. Shred or chop the leaves. Warm your skillet over high heat and add a tiny splash of olive oil. Add the kale to the pan and press the kale into the heat and oil for about thirty seconds. Then turn off the heat and transfer the kale to a large mixing bowl. Set aside. Warm the skillet again, over high heat. Add a drizzle of EVOO. Dry your tofu cubes as well as you can and add them to the skillet. cook for two minutes them flip and cook for another few minutes. When the tofu cubes are browned, add a sprinkle of smoky paprika, a pinch of salt and a drizzle of maple syrup. You can all three of these things to taste. Turn the heat OFF and let the tofu sizzle in the hot pan, absorbing all the maple and spice. Push the tofu to one side of the skillet, add another drizzle of olive oil and add the boiled potatoes. Add a sprinkle of smoky paprika and a pinch of salt. Cook the potatoes over high heat for two minutes, toss and cook for another minute or so, just until you start to see some color on the sides. The maple syrup and spice should help with that. Turn off heat when done and allow these ingredients to rest. Optional: If adding cashews, add them to the skillet a few minutes before turning the heat off – they will candy and toast with the maple syrup in the pan. Add more if needed. Dressing: Place all the ingredients in a high speed blender and blend until smooth and creamy. Add a few splashes of water to thin things out to your desired consistency. 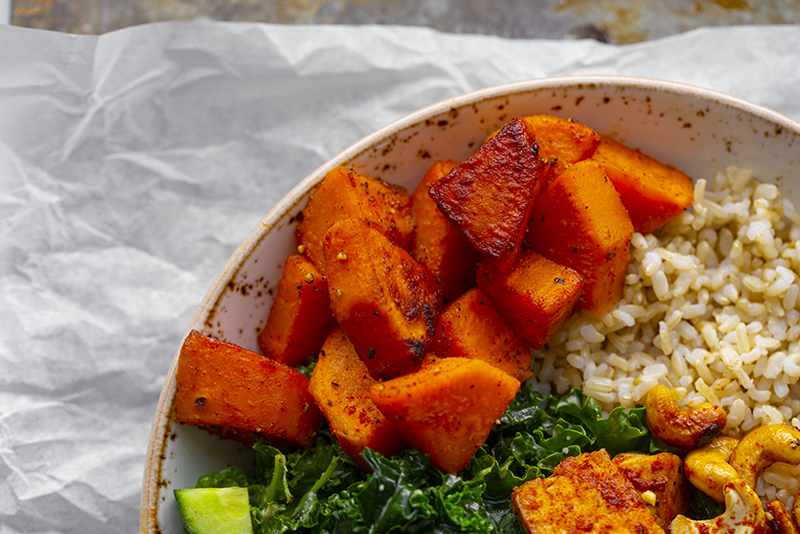 Build Your Bowl: Add the rice and kale side by side. 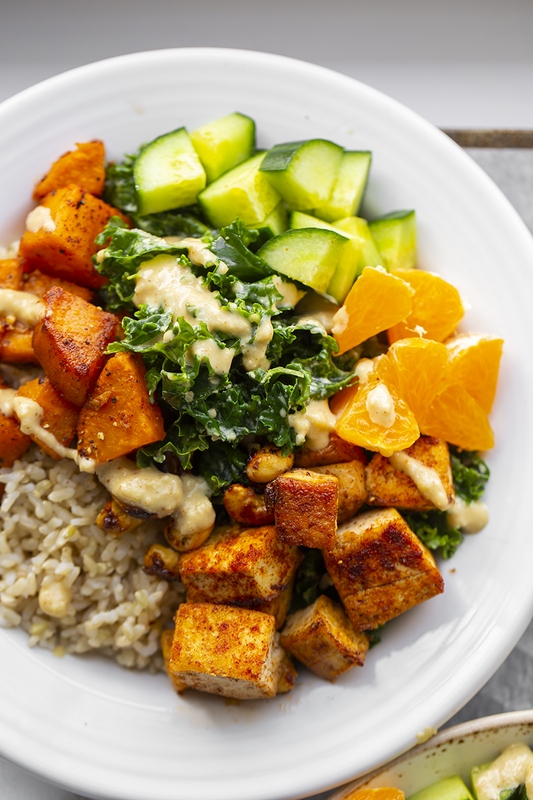 Then on top add: tofu, sweet potatoes, cucumber, citrus, optional cashews and anything else you might want to add to your bowl. Drizzle some dressing over top and serve! Rev It Up With These Fast Fitness Tips! © Copyright 2018. HealthTip.Biz All Rights Reserved.